The oldest record of Schloss Neuhaus dates back to 1219, when it was property of Konrad von Neuhaus. Prince Archbishop Eberhard III. extended it in 1424 and it became a courthouse after 1508. Franz Count Lodron rented Neuhaus Castle from 1796 to 1811, when he eventually purchased it. In 1851 it was sold to the Count Oswald Thun and was modernised to its current state, making it the ugly neo-Gothic thing it is. However, the centre of Schloss Neuhaus still holds the medieval keep. Today and ever since 1963, Neuhaus Castle is private property of the Topic-Mimara family and not open to the general public. It contains an art and photo gallery. 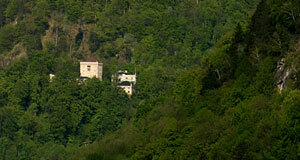 The castle sits on a very exposed cliff of Mount Küberg, a hill reaching into the district of Gnigl. It can be seen from many spots in Salzburg; note the nearby Gnigl Parish Church, a lovely Baroque building.